1. Rejoice and be Glad! Pope Francis' third apostolic exhortation came out this Monday and it's making headlines and waves. Just what is an apostolic exhortation? According to a guide for Church documents published by EWTN, an apostolic exhortation is used by the Pope “to communicate to the Church the conclusions [the Pope] has reached after consideration of the recommendations of a Synod of Bishops. He has also used it in other circumstances, such as to exhort religious to a deeper evangelical life.” Apostolic exhortations are considered to be some of the highest ranking papal documents, ranking after Encyclical Letters. Gaudete et exsultate is all about practical ways to holiness. In Gaudete et exsultate, Pope Francis encouraged all people today to embrace the call to holiness in today’s modern world. Want to know more? Here are 7 things Pope Francis wants you to know about holiness, and his five signs of holiness in today's world. Oh, and you're going to want to read what he has to say about women! If you haven't had a chance to read Gaudete et exsultate, make it your weekend reading. It's an easy read, and it's not too long. Before you read it, check out this article about how to (and how not to read!) the exhortation. Up to this point in my life, I've never won anything. Sweepstakes, raffles, contests . . .they all pass me by. I haven't even won a cake at the church social cake walk. Until now, friends. I'm declaring my 23rd year as the year of all the free things. I've won movie tickets and blog giveaways. A couple weeks ago, I guessed a baby's due date right on Facebook and got a free Catholic subscription box. I'm telling you, I don't even know how to handle this luck. If I were smart, I'd head out to buy a lottery ticket. But hey, why buy one? I have a pretty good chances of winning a ticket in a giveaway at this point. Thanks to our lack of doctor appointments this year, Joseph and I have quite a bit of money in our HSA account. 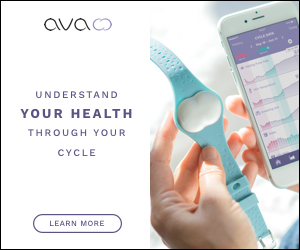 We decided to buy an Ava watch, which is a clinically tested device that uses sensors to reveal what's really happening in a woman's body during a cycle. I think that charting your fertility as a woman may be the best self-care you can give yourself, so I'm excited to see all the extra data that Ava gathers! I wore the Ava watch last night for the first time, woke up, and synced the data with the app on my phone. Well, I tried to sync the information. First I had to battle my way through blue tooth, low phone battery, finding a charger that I'd buried in my purse, and plugging everything in. But after that, it was neat to see how much sleep I'd gotten, how much deep sleep I'd actually gotten, what my body temperature was, and what my heart rate was last night. More information about experience with Ava will be coming as the months go on! You can find out more about Ava and the technology it uses here! I've received so many beautiful books to read for my podcast and blog this week! I can't wait to share the topics with you soon. This week, I'm digging into a book on annulments perfectionism and parenting, gratitude, marriage and being a brave woman. Needless to say, we're going to need another bookshelf (or seven). 5. Speaking of books . . .
After tackling Father Gallagher's Discernment of Spirits, my women's accountability picked another book for our formation nights. We ended up deciding on Henri Nouwen's Life of the Beloved. Holy smokes, friends. If you haven't dug into this book, you need to. We read the prologue this week and met to discuss our favorite parts of the book. Sister Miriam James Heidland hosts a weekly podcast with Michelle Benzinger and Heather Khym called Abiding Together. This Lent, they read Life of the Beloved together, so our women's group begins the discussion by listening to the podcast episode that corresponds to our reading that night. Spoiler alert, it's fantastic. Still on the fence of whether you should put this book on your 'to-read' list? Check out this quote we're pondering this week: "Your story is the story with which you can come to know God's story better. And it is His story that makes your story worth living." Next week on The Catholic Podcast, Joe Heschmeyer visits with Sebastian D'Amico from Holy Family School of Faith here in the Archdiocese of Kansas City in Kansas. They're going to be discussing the Shroud of Turin. Joe and Sebastian discuss the theology, history, and science behind either the most incredible art history forgery in the history of the world, or the most incredible relic in all of Christendom. You'll be able to listen to their episode on Monday. Find it on iTunes, Google Play, or at cathpod.com! Although Wilson loves his rug of freedom, sometimes his mood prevents him from enjoying a good time. This week, my women's accountability group came over for our books study and we opened Wilson's cage. But instead of hopping around and seeing everyone, he stayed in his cage and glared at everyone. It's okay, Wilson, we all have bad days.